The discovery of quartz reefs at Long Gully in 1885 stimulated an influx of miners again. By 1889, there was a battery in operation and 20 timber houses along Gray's Creek, as well as a general store, butchery, bakery and Mechanics' Institute hall. A private school had already been operating when a government school commenced in the hall in 1890. Although still generally known as Long Gully, the settlement at the northern end of the goldfield was officially named Cassilis, after the pastoral run which had encompassed the area. Cassilis is a district in Scotland. A settlement at the southern end of the goldfield was known as Tongio West. In 1903 the school was transferred here. Bald Hill Creek, to the east, was also regarded as part of the Long Gully goldfield. The small township here was named Nugong in 1889. There were 600 people on the goldfield at its peak. The mention of rail from Bairnsdale to Cassilis is wrong. There was only a track. Of the many reef mines, the Cassilis, the Mount Hepburn and King Cassilis were the largest. 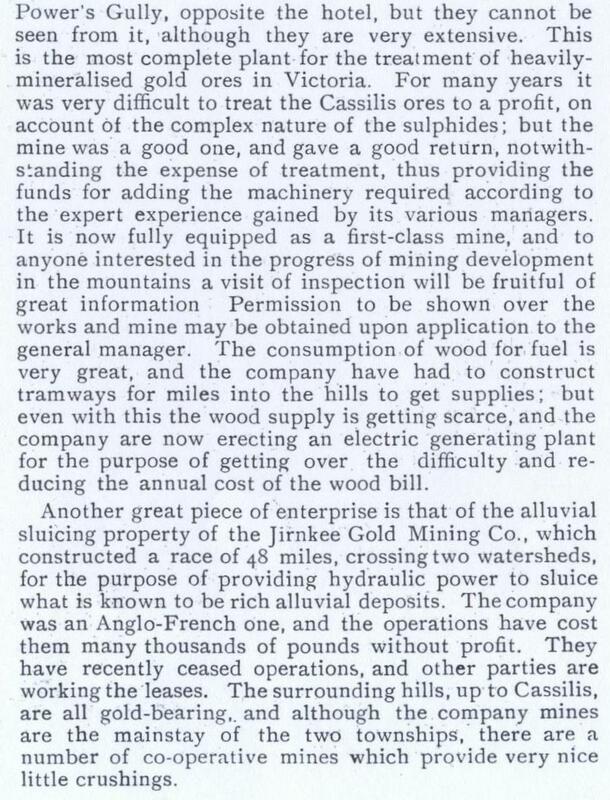 The Cassilis Mine constructed a hydroelectric power station to overcome the dwindling supply of timber and sometimes unreliable water supply. The power station was located on the Cobungra River, 25 km north of Cassilis. Water from the Victoria River was conveyed nearly 5 km by open race to the power station. The scheme was completed by 1908 but did not fulfil expectations. The ore from the field proved difficult to treat and various methods of extracting the gold were tried. An extensive cyanide plant was constructed at the King Cassilis Mine about 1896 but was not a great success. This mine closed down in 1900 and the Cassilis had closed by 1918. The Jirnkee Sluicing Company worked Long Gully from 1901. A race more than 75 km long was constructed from the Wentworth River to the south-west to bring water to power the dredge, but this operation also was not successful. The town declined rapidly after the closure of the large mines and many buildings were taken away. From 1934 to 1938 there was some mining activity, treating tailings with cyanide. The Mount Hepburn Company had an elaborate treatment works (1896-1907) and there are substantial industrial remnants. The site was revived in the 1930s-1940s and it is heritage listed. 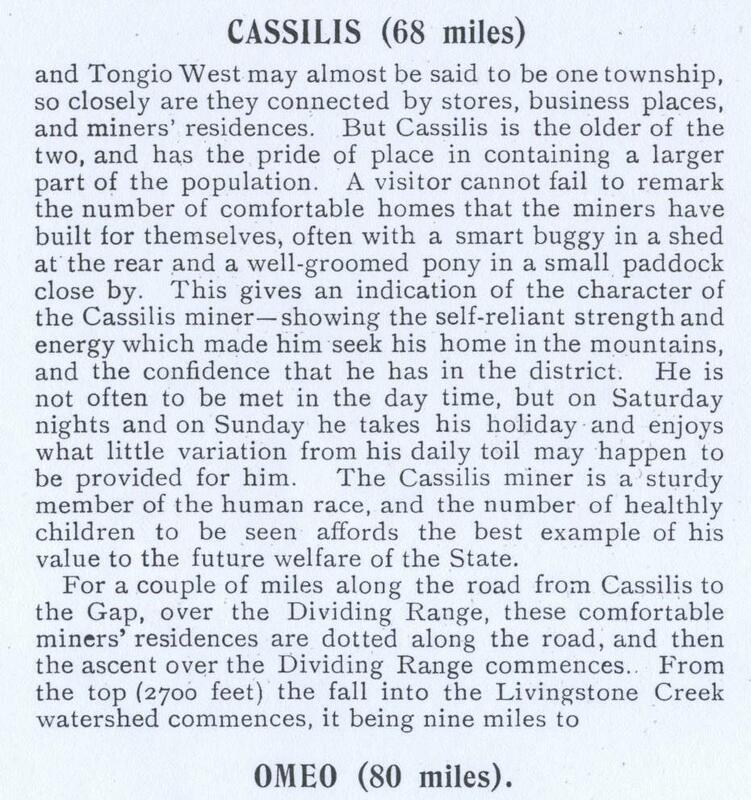 The Cassilis school (originally Long Gully) opened in 1890 and was transferred to Tongio West in 1903. Some remaining buildings were destroyed in the 1939 bushfires. Today the area is again used for grazing. Part of the valley is reserved as the Cassilis Historic Area. Many relics of gold mining days can be seen, such as shaft entrances, tramways and mullock heaps. Remains of the batteries and ore treatment works are visible, including the stone foundations for the cyanide vats. Several short walks follow the routes of old water races. The site of the hydroelectric power station is also reserved as the Victoria Falls Historic Area.